2015 Domaine La Grange Tiphaine “Becarre“ Touraine-Amboise Rouge, by Damien Delecheneau Vigneron, Loire Valley, France. The 100% Cabernet Franc Becarre from Coralie and Damien Delecheneau’s Domaine la Grange Tiphaine in the Tourairne-Amboise is a wine of natural styling with an earthy character with dark fruits, an array of spice and herbs, chalky stones and rustic notes. Damien, the third generation to run this winery, studied oenology and viticulture in Bordeaux before working at wineries in California and South Africa, returning to the family estate in 2002 to take over the reins, now working fully biodynamic and with minimal intervention in the cellar. 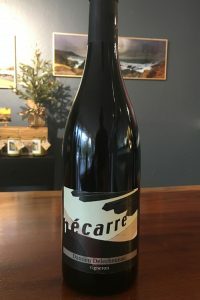 The Becarre comes from a plot of vines that are on average 20 years old set on calcareous Silex and red clay soils, it was fermented using native yeasts with a gentile maceration in cuve and concrete vats, with aging done in mostly used barriques with the elevage lasting about 9 months before bottling with the absolute minimum of sulfur and filtering to preserve the purity of the wine and sense of terroir. Damien, who’s know the president of the Montlouis AOC winegrowers association was inspired by Francois Chidaine and is well respected as a winemaker, he produces a set of reds, whites, a rosé and sparkling wines that he hand crafts from five different varieties: Chenin Blanc, Côt (Malbec), Gamay, Cabernet Franc, and even the ancient and rare Loire variety called, Grolleau, all from Montlouis and Touraine. While all organic and a natty winemaker, and according to the winery, the design of the winery itself and the steps taken to ensure quality in his wines rival some of the most technically advanced wineries in the world, but this is all in the name of using as few additives as possible, to evoke their precious terroir in its purest sense. This Cabernet Franc really impresses with a little air gaining violets, truffle, a hint of bell pepper and lovely textured red fruits along with a core of currant and blackberry as well as mineral notes and a bit of rustic leather, cedar and licorice. Delecheneau’s Becarre is a classic Loire Franc and shows good intensity of fruit, well hidden firm tannins and subtle acidity that allow allow a ripe sense of fruit to shine brightly here, making for a real pleasure in the glass, best though with cuisine, drink over the next 3 to 5 years.